As I have followed and posted on the Tim Tebow pro-life Superbowl ad set to run this coming Sunday, I uncovered some horrifying and morbidly unethical pro-murder advocates in the process. 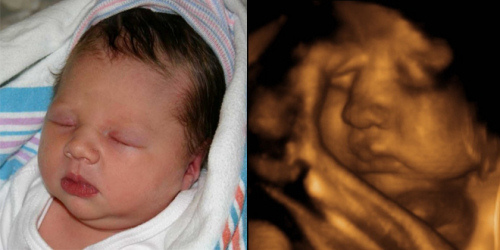 First, I would like to show you, with amazing new technology, the children whom pro-choicers refer to as “a clump of cells”. 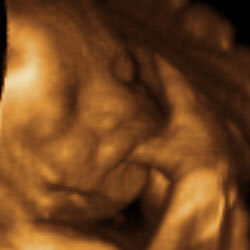 With new 3D ultrasound machines mothers can now see exactly what their babies look like before they are born. 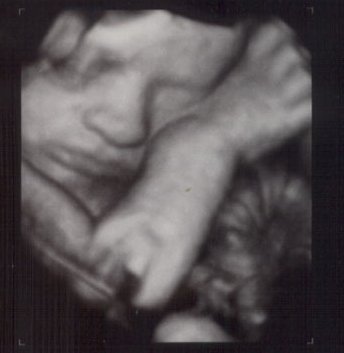 You can see the contours of the face, the individual fingers and even the habits of the unborn child. The gift of life has never been so clear. Look at the striking resemblance between the two photos. “The most disgraceful thing is happening! Please, please send this email to your entire list and ask those people to do the same! This deceit must go viral! We cannot let this election be stolen!